As you might have known it's been pretty hot here in the Texas Hill Country lately. 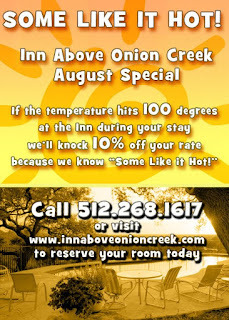 Well the staff at the Inn Above Onion Creek know that "Some Like It Hot" and are rewarding those who don't mind a bit of heat with a Hill Country lodging offer. Take a look at the flier below to see what Amy and Don have come up with to make your next trip to the Austin, TX area a bit cooler on the wallet. There are lots of great activities to stay cool during your Hill Country Vacation: Floating in the pool at the Inn, visiting the Inn Above Onion Creek spa, a morning trip to Wimberley Zipline Adventures where the cool breeze moves through your hair as you fly high above the Texas Hill Country. And don't forget Mandola Winery is having their red wine release dinner celebration later this month.